Le moment est venu d’inscrire votre chien pour une photo dans le calendrier 2020 de Rosie! Nombre de places limité. Ne ratez pas votre chance… la demande est forte! TOUS LES CHIENS SONT LES BIENVENUS. Nul besoin que votre chien vienne de Rosie ni même qu’il ait été secouru. Il faut juste qu’il soit le plus beau et le plus fin à vos yeux! ALL DOGS ARE WELCOME. Your dog does not need to be a Rosie dog or a rescue, just a star in your eyes! Space is limited with a demand to be part of this beautiful calendar! The shirts are perfect for a unique gift, with the huge bonus that it gives back to the Rosie Animal Adoption dogs. Purchase one for your loved ones while quantity last! Adopting Echo was one of the best things I ever did. He makes me so happy and is so full of love. And I’m pretty sure the feeling is mutual. 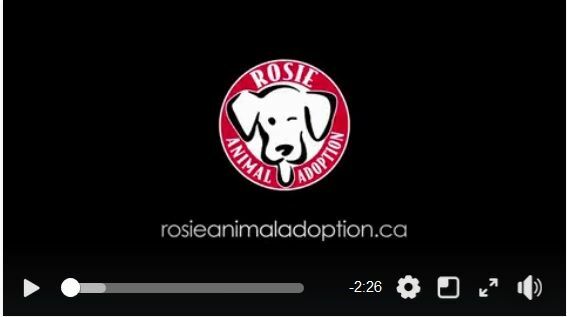 Saturday, April 14th, in honor of Rosie’s Sweet 16 Anniversary, Service vétérinaire mobile Dr C. Nosotti Inc. pledged to donate $1 to Rosie Animal Adoption for every new Facebook Like and Follow the Mobile Service received. We originally thought to run the pledge during the party but chose instead to count the new likes from when the pledge was first posted on the Rosie site on Friday and run it until Sunday at midnight. This allowed us to count 111 new likes. There was an offer to match the pledge with an additional $1 per like, so Rosie’s received a total donation of $222. A big thank you to all who organized the day and to Rosie’s for the great work they do. Quoi de neuf chez Adoption animale Rosie?